SSuite Recipe Organiser (or SSuite Office – Recipe Organiser) is a handy digital recipe organizer software to create, edit, and store all of your favorite recipes. Thus, any favorite recipe that you want to prepare can be stored here, so that you can use it anytime. For each new recipe, you will be able to write summary, insert images, web links for online help, can highlight import text, and more. To prepare a delicious dish, say a chocolate cake, you need to care about multiple things. You need to know ingredients, equipments, instructions, and many other things. For all those things, you can use this free recipe organizer and can create your own database of your favorite recipes. You will be able to add multiple categories with custom name, and can insert recipes inside those categories. We have also covered 5 free cookbook software for you. 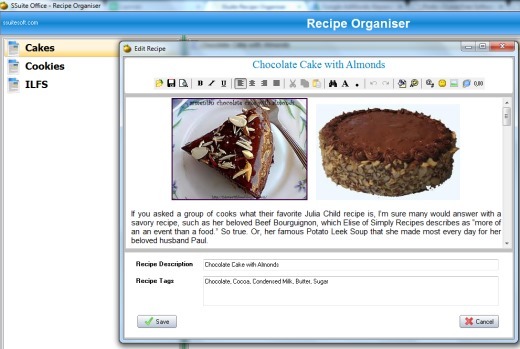 How To Use This Free Recipe Organiser To Create and Store Your Own Recipes? 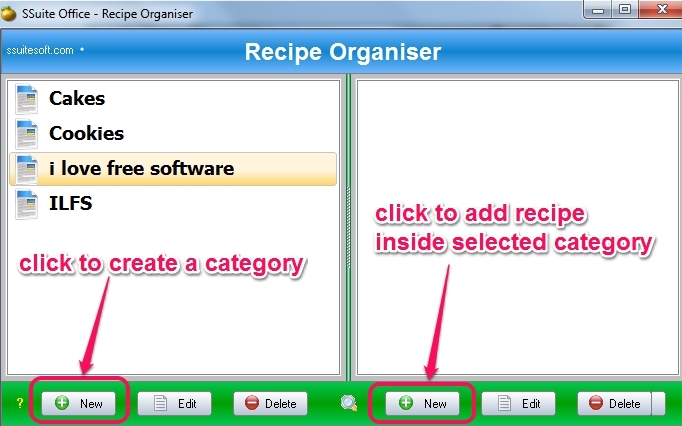 SSuite Recipe Organiser is a portable software, which doesn’t require installation. At the end of this review, you can find download link for its zip archive. Extract the archive and you will get executable application file. Run that file by double-clicking and interface of this recipe organiser will open. Its interface comes with two preset recipes, which will give you an idea about how you can add things while creating a recipe. To add your own recipe, you first need to create a category for that recipe. After that, you can add recipe inside that category. While adding a new recipe, you can add recipe description (that will become recipe title), and recipe tags that help to quickly search a category and open associated recipe from bunch of recipes. Enter these details and start writing recipe details. You can even copy paste recipe details from Internet. But to insert images, you need to use available button for it. Toolbar available at top of recipe window will help you to insert images to your recipes. 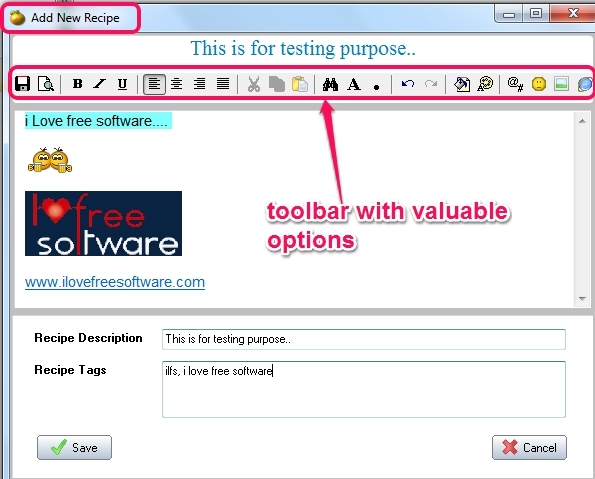 Apart from inserting images, there are many valuable options present in toolbar, which you can use to perfectly design the recipe. Options such as: set text alignment, highlight a line or important term, bold/italic/underline the text, customize font color, insert emoticons at a certain place, and more are available in toolbar. Use those options and save your recipe to start a new recipe with new category. A user-friendly software to create multiple recipe categories and insert recipes in those categories. Conversion option is also available that helps to convert cups & spoons/weight/liquids/length values into millilitres/pounds/ounces/pints/desimeters. As a well prepared dish depends on exact quantity of ingredients, this option is really beneficial. 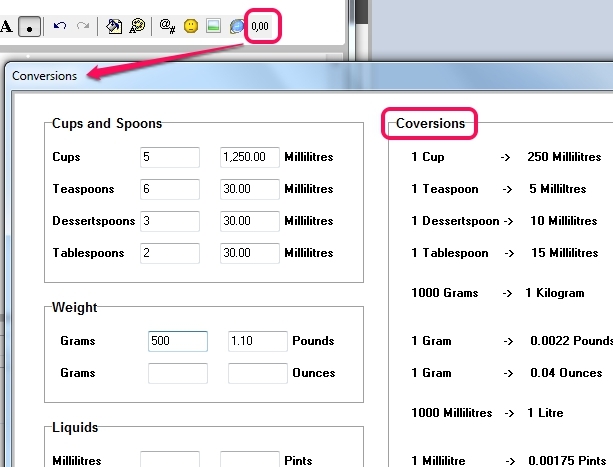 Use toolbar to access Conversions window and convert values to insert in your recipe. Recipe description and tags can be added that help to search a particular recipe quickly. You can customize font size, color while adding text for a recipe. Images and links can also be inserted for a recipe. You can insert special characters and emoticons as well. This might help to get back your interest, if recipe description is getting boring for you. Portable software that comes in a zip archive (just 1.90 MB in size). SSuite Recipe Organiser is beneficial for all those people who take interest in preparing new recipes on their own. Whole database of recipes can be created and stored with this simple yet effective recipe organizer. Get SSuite Recipe Organiser free. You might want to look at these 5 free recipe apps for Android.